At some point in your wedding planning, you’ll be thinking about the perfect dress, but don’t forget about the perfect wedding set. Without a necklace, earrings and a bracelet, your wedding look isn’t complete. You want a bridal set that will really make your beloved’s mouth drop open when he sees you walking down the aisle. We all know it’s the accessories that make the outfit, and that includes your wedding dress. An elegant or unique necklace, bracelet as well as earrings will elevate the dress. We had to include this first on the list because it’s a stunning wedding set but it’s also a traditional pearl set that is expected on your wedding day. It’s expected and traditional because it’s an elegant and timeless string of pearls. 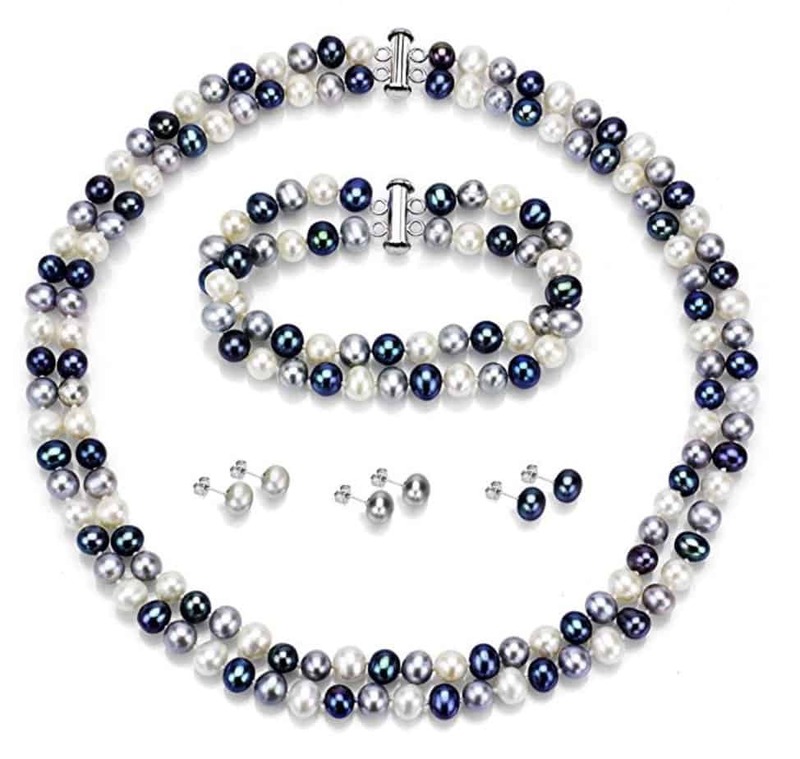 This set of cultured pearls comes with an appraisal certificate, so you’ll know you’re getting an heirloom quality jewelry set. These pearls range in size from 7.5 to 8.5 mm. You can purchase the exact length that suits your dress. They range in sizes from 16 inches to 51 inches. The luster of these pearls is considered AAA while the shape is slightly off round at AA. 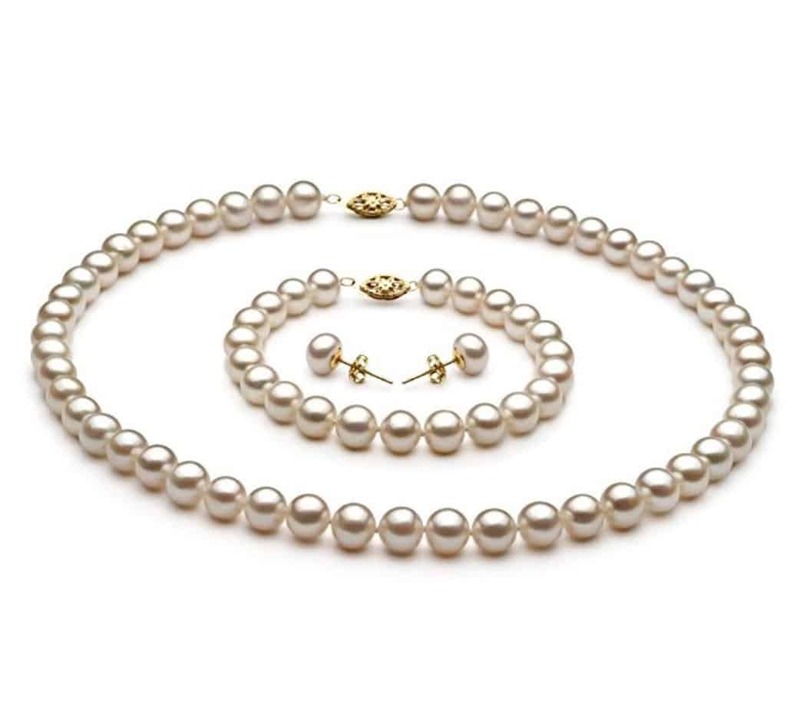 Each pearl is protected with a double knot between them, so they won’t rub together. The set comes with a necklace, bracelet and matching earrings for your wedding day. While the previous wedding set was traditional and timeless, this next set is unique and eye catching. Your new husband will never forget how you looked coming down the aisle wearing a traditional look of pearls in this stunning sterling silver version. 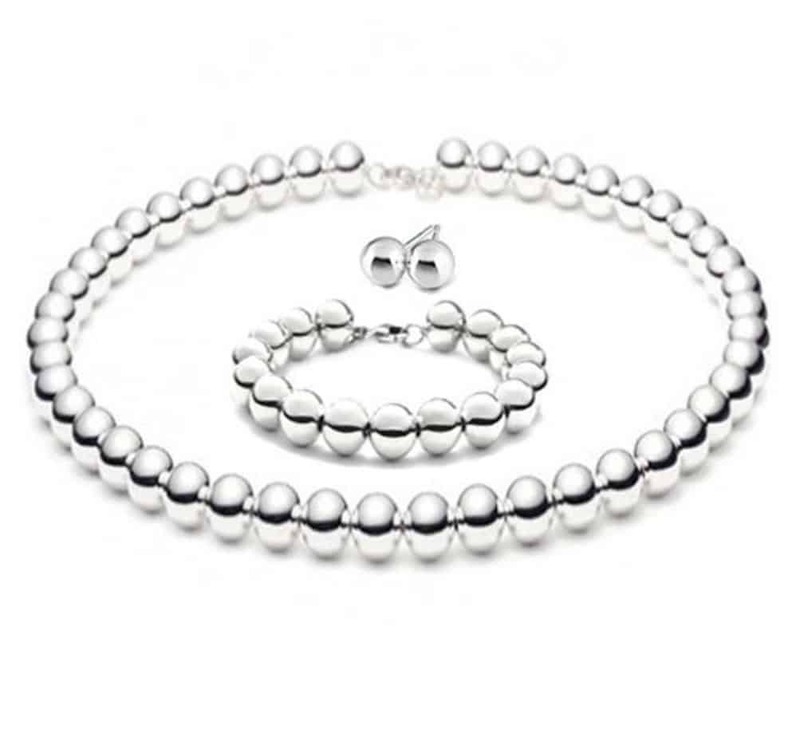 The sterling silver ball beads measure 10 mm and are hollow, so they won’t be extremely heavy on the body. You’ll be wearing these for hours. They won’t weigh you down. The necklace is 18 inches long and the bracelet is 8 inches. The set is stamped with .925 sterling, which means it’s real sterling silver. A string of pearls is a timeless look for a wedding, but some brides want to be a bit less traditional. This set gives you both a timeless and unique look on your wedding day. There are two rows of pearls on the necklace and bracelet in this set with 3 colors of dyed pearls. The necklace is 18 inches on the longest string while the inner string is closer to 17 inches. The matching bracelet has the same color pearls, and it comes with three sets of earrings, so you can choose the color you’d like to wear with it. This is a set that can be worn on a daily basis or to other events too. You have the choice of pearl size between 6-6.5 mm or 7-7.5 mm. This string of pearls and matching bridal set is a lovely shade of cream that will match the theme of your wedding, no matter the color. The pearls are button shape of a very good uniformity. They’re a high luster cream color with a slight tint of pink in them, which we’d classify as a champagne tint. The clasp is sterling silver with a 925 stamp to verify its content. 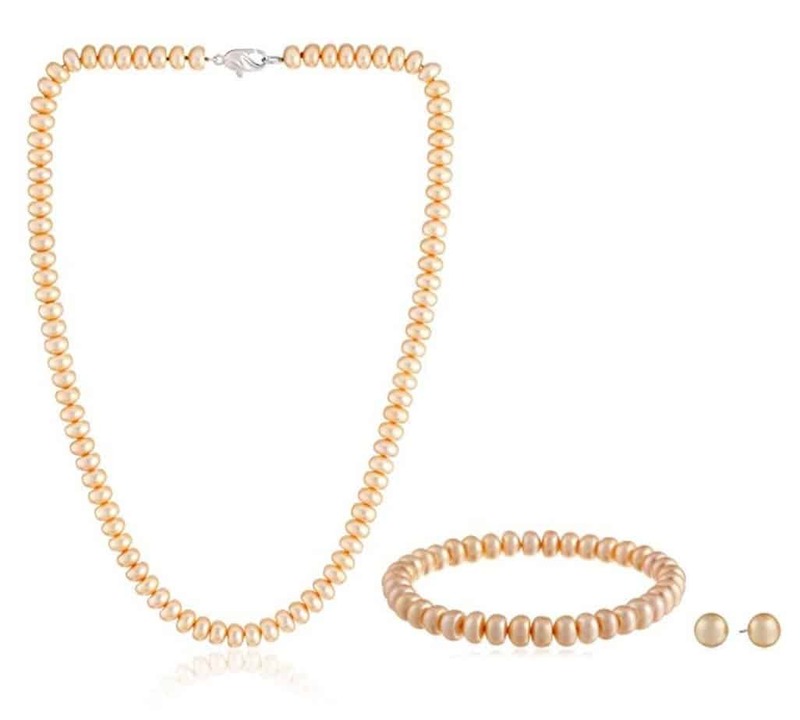 The set includes a string of pearls, a bracelet and matching earrings. bracelet, earrings and a ring. You might want to go without the ring for your special day since you’ll be getting one from your new husband. Otherwise, this set is absolutely stunning and perfect for your wedding day. It wouldn’t be a wedding set list without “something blue” for your wedding day. These blue sapphires are exceptional. The pendant and earrings are set in .925 sterling silver with a rhodium coating to make them truly shine. 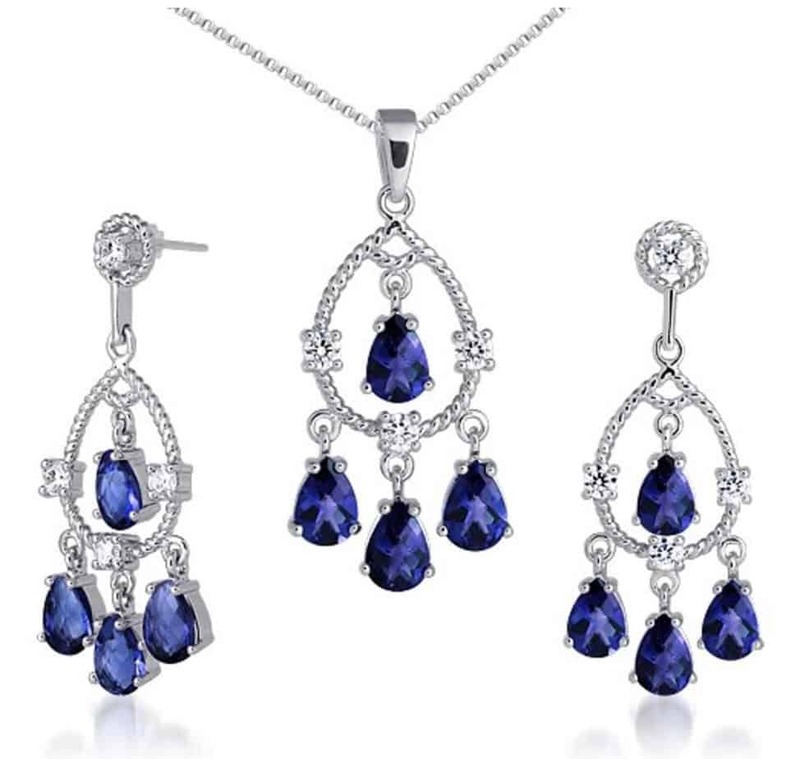 They’re created blue sapphires combined with Cubic Zirconia. The earrings and pendant have a combined weight of 9.50 grams. The sapphires are 7 x 5 mm and the CZ stones are 3 mm. The gemstones are AAA quality with a truly vibrant blue that will really shine. For your wedding day, you’ll want a set that truly sings for you. When you tried on your dress and cried a little, that feeling should continue with the bridal set that you choose. Make sure it’s an absolutely perfect day since it’s one of the most important of your life.